It’s not always easy to face our limits. To know how weak we are or how much we need others. Whatever the reason, limits exist. Eventually we have to face the limits in our lives in order to understand them. Hopefully we can find a way around our limits. This isn’t going to happen every time though. How can we face the limits we have to keep? How can we live well with what we can’t erase? Of course, God can work miracles. Jesus could (and will) return. All of that is up to Him. Not us. This may come as a surprise if you don’t know me personally, but I don’t pray for God to take away my Arthrogryposis. I’ve never felt called or impelled to pray for that kind of full-body healing. And that’s really a whole different topic we will have to discuss another time. 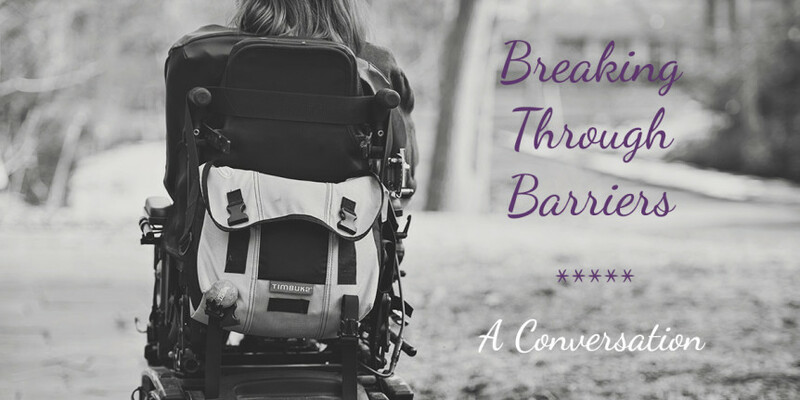 The Arthrogryposis brings lots of limits and obstacles. I can’t deny the facts. But I can live with the challenges. The disability side of life has never been my focus. I see possibilities. I look for endless options. I still might ask what’s normal in different scenarios because this practice helps me to face my limits. I can daydream or wish to do something, but I’m probably going to need help. I have days where I don’t want to ask for help. Then I’m limiting myself. Maybe so-and-so would love to join me in reaching my next goal or going on that adventure. You can fill in the details. Imagine your own scenario. Are you putting limits on yourself? Are you afraid to admit those limits to others? I know it can be hard to constantly feel limited, but I also know I can create extra limits. Am I willing to be my whole self? The one with physical limits AND the one who sees BEYOND all of that? I’m not myself without the disability. I’m not myself without the perspective of normal and moving past any limits. Embracing our “normal” starts in our minds. It’s what we tell ourselves. Then we can be OK with how God made us. We will continue the conversation as I share my simple dreams.